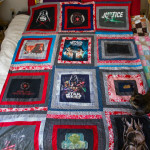 admin, Author at Superior Quilt Co.
Back in 2012, I showed off my Star Wars T-shirt quilt top to you. I told you all about how I’d constructed it over the past six months from thrifted Star Wars T-shirts that it had taken me years to collect. I shared details of the log cabin style that I’d used to piece it, and the color scheme that I’d selected that would enable me to best utilize my stash fabric. I told you that for my husband’s birthday, I planned to back the finished top simply with flannel, then quilt it. When I said “birthday,” I meant “anniversary,” and when I said “planned,” I meant that I would do it four years later. Four entire years later, here is the finished quilt! This quilt top has sat in my WIP pile for four years. We moved in that time, and I took it with me. We got a bigger bed, and I put off finishing it, dreading having to enlarge the quilt from a queen to a king. Several birthdays and anniversaries and Christmases passed, and I always found something else to give my husband. And then the new Star Wars movie came out (and if you haven’t seen it, it’s WONDERFUL! ), and suddenly, there was all this Star Wars fabric in the fabric stores! Want to know a sure-fire way to get someone to finish a years-old WIP? Tell them that they get to buy themselves some new fabric to do it! Although the rest of the quilt is sewn entirely from thrifted and stash fabrics, it turned out that some new fabric was just the inspiration that I needed to finish this project up. I toyed with the idea of using my new Star Wars prints in flannel and cotton to add a border around the quilt, thereby resizing it to fit our king-sized bed, but everything that I tried looked janky. Finally, I decided that I’d rather have a quilt that I like the look of, even if it’s too narrow to fit our bed, than a quilt that fits well but gets on my nerves every time I see it, and I used that new fabric, along with some stash, to piece the quilt back. The quilt isn’t even technically a quilt, because instead of quilting it, I tied it at all four corners of every T-shirt piece. 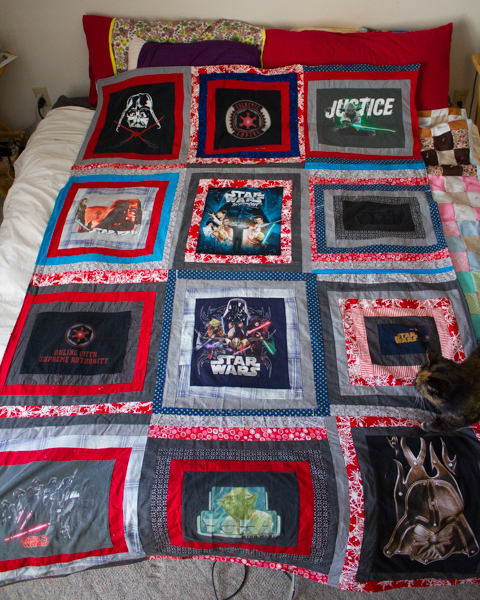 Four years, my Friends, and in the end, this Star Wars T-shirt quilt took one day to finish. I can’t wait to see what I’m going to accomplish in another four years! We spend around a third of our lives sleeping; it is vital to our survival, but despite years of research, scientists still aren’t entirely sure why we do it. The urge to sleep is all-consuming, and if we are deprived of it, we will eventually slip into slumber even if the situation is life-threatening. Sleep is common to mammals, birds and reptiles and has been conserved through evolution, even though it prevents us from performing tasks such as eating, reproducing and raising young. It is as important as food for keeping us alive; without it, rats will die within two or three weeks – the same amount of time it takes to die of starvation. But what if you just can’t nod off? 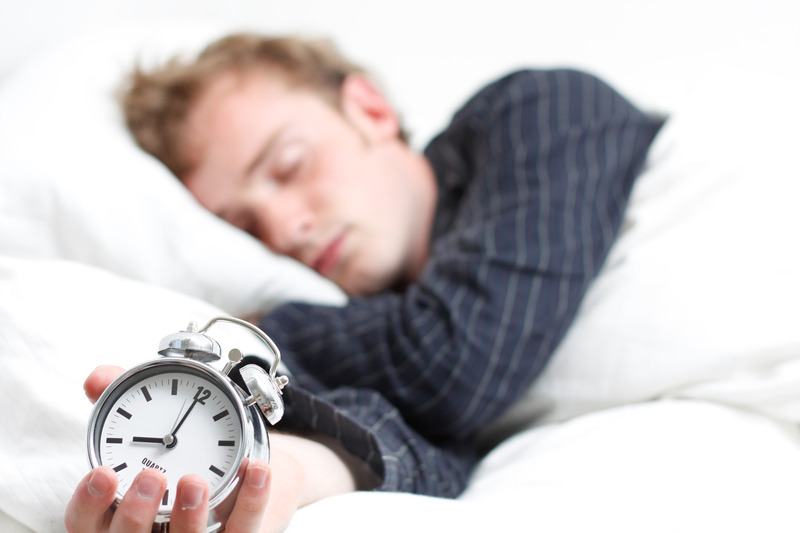 Understanding your biological clock is the key to a healthy night’s sleep. Your body is driven by an internal circadian master clock known as the suprachiasmatic nucleus, which is set on a time scale of roughly 24 hours. This biological clock is set by sunlight; blue light hits special receptors in your eyes, which feed back to the master clock and on to the pineal gland. This suppresses the production of the sleep hormone melatonin and tells your brain that it is time to wake up. Disruptions in light exposure can play havoc with your sleep, so it is important to ensure that your bedroom is as dark as possible. Many electronic devices produce enough light to reset your biological clock, and using backlit screens late at night can confuse your brain, preventing the production of melatonin and delaying your sleep. Ensuring you see sunlight in the morning can help to keep your circadian clock in line, and sticking to a regular sleep schedule, even at the weekends, helps to keep this rhythm regular. Another important factor in a good night’s sleep is winding down before bed. Stimulants like caffeine and nicotine keep your brain alert and can seriously disrupt your sleep, and even depressants like alcohol can have a negative effect; even though it calms the brain, it interferes with normal sleep cycles, preventing proper deep and REM sleep.